Welcome to Malek Properties – Home of PROFESSIONAL and EFFECTIVE Real Estate Service. 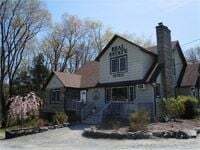 Founded in 1997, we serve buyers and sellers in Sullivan County, NY and the surrounding areas in Residential and Commercial transactions. In today’s competitive real estate market, timing is everything. Get up to the minute info on your search with new listings and price changes delivered directly to you as they occur. Be on top of the hottest new and reduced listings for sale in Sullivan County with automatic notifications. Whether buying or selling, there are many elements to maintain a smooth transaction, and we have a handle on them. Our professionals have the pulse on the local market, and we are long time members of the Sullivan County Board of Realtors and subscribe to both Sullivan County Multiple Listing Service and the Hudson Gateway Multiple Listing Service for access to thousands of properties, as well as superior exposure for our sellers. If you are purchasing a vacation home, primary residence or a commercial property, we have the solution. For vacant land to build that dream home or a commercial project, or if a farm is your heart’s desire, we can help you locate the property and work with you on a successful close. If you are selling, we offer a very attractive marketing strategy to help you realize your goals quickly. We can help you with every aspect of buying or selling your property: Residential, Commercial, Land, Farms, Waterfront, Vacation Homes and Rentals. Call or email us today! Sullivan County is less than 2 hours from NYC but is a world away! Our magnificent and breathtaking rural countryside offers a relaxing, peaceful and secure lifestyle where nature abounds. Discover this world where crystal clear lakes, babbling brooks, magical mountains, golden hay fields, plush green forests, and clean fresh air are a part of everyday life. Sullivan County offers year-round recreational opportunities and a wealth of cultural and historic attractions. Enjoy antiquing, golfing, hiking, fishing, swimming, canoeing, rafting, motor boating, biking, horseback riding, gardening, bird watching, nature walks, camping, hunting, snowmobiling, skiing, skating, and more. Enjoy world class entertainment at Bethel Woods, and fine cuisine at one of our waterfront restaurants. There is something for everyone here in Sullivan County, but most importantly… Unsurpassed quality of life! Country Living at it’s finest!